recommended for: Fans of Greek epics, Ella Enchanted by Gail Carson Levine, Howl's Moving Castle by Diana Wynne Jones, and Throne of Glass by Sarah J. Maas. Princesses of all ages. My recent reviews may trick you into thinking I love every book I read; I don't. I've just come across some winners lately. Cruel Beauty is a definite winner. I read it pretty much straight through, entranced by the gorgeous writing and mythical atmosphere. It has all the magic and quirkiness of its forebear, Beauty and the Beast, but takes the story far beyond its inspiration. This is a world cursed, locked in a paper sky. A girl raised to marry and destroy the evil overlord. A tortured demon and his imprisoned shadow. The set-up alone is compelling, but Hodge's true gift is in her imagination. Much of the plot centers around Nyx's exploration of a labyrinthine, ever-changing house with wildly creative rooms. Like Nyx, I felt equal terror and excitement at what the next room might be, what secrets the objects hid. There's the interweaving of Greek mythology with Hodge's own created mythos, a religion of tricksters and hedge gods. Then we have Ignifex and Shade, a demon and his shadow, both complex characters that tread the line between good and evil. And of course Nyx, torn between duty to her family and hatred for their place in her imprisonment. Hodge made me believe in and love these characters so that their struggles were mine, their victories mine. Reading this multilayered book, I felt the same impatient glee that I felt when first reading my favorite book, Diana Wynne Jones' Howl's Moving Castle. And when I turned that final page, I felt the strongest urge to read it all over again. This book is proof that you don't need battles and huge crazy twists to keep a reader's interest. What works for Hodge is mystery. When you meet Nyx, it's her wedding day. She's preparing for her marriage--and death--to the lord that imprisoned and rules Arcadia. We know that Arcadia is trapped beneath a paper sky. We know the wizards of the magical Hermetic arts have trained Nyx to stop him. We don't know much else. Why was Nyx chosen to sacrifice herself? How did Arcadia become trapped? What awaits Nyx at the Gentle Lord's castle? These questions are only multiplied when Nyx enters the castle and finds the Gentle Lord as captivating as he is cruel. The slow burn of their relationship is satisfying. It starts with Nyx's many attempts to kill him, which dissolves into snarky (eventually flirty) banter. Snarky banter is my biggest weakness and immediately endeared me to Ignifex. Then of course there's Shade, the gentle prisoner who shows Nyx the house's secrets and believes she can be a hero. The triangle between them is dealt with tactfully, without undue angst and with a startling conclusion. My lips are sealed. As exciting as watching Nyx grow to love and understand her captor and fellow captive was adventuring with her through the castle. Honestly, I can't think of a slow moment. It becomes clear early on that darker things than Ignifex are at work here, more powerful things. Strange things that seem determined to keep Nyx in the dark. Hodge covets her secrets and reveals them at precisely the right moments (or the wrong ones, much to the characters' dismay). She also has the cruel talent of turning the story entirely around as soon as everything is coming together. I'm pretty sure I shouted, "Noooo!" at one point from pure frustration. The good kind. I'm still mixed on how the ending worked out, whether it was too deus ex machina, too convenient, but not enough that I didn't enjoy it. It's a complicated ending that answers questions and leaves you with more. You're left to construct your own narrative for what happens next--which is part of why I think the way she leaves it is so effective. I love my fairy tale rewrites. There's something so exciting about finding something familiar in something new. The best rewrites take the spirit of the original and run with it (think Cinder by Marissa Meyer, Ella Enchanted by Gail Carson Levine). Hodge certainly meets this requirement. We have Beauty and the Beast in an alternate version of Greece, where the gods are still believed and magic is a refuge from the ever-present threat of demon invasion. Cool, huh? Yes, I'm a sucker for Greek mythology. I'm also a sucker for strange houses with minds of their own. Hodge has some clever nods to the original, with Nyx's love of books and the "beast's" curse. She's also made it entirely her own. The beast is a demon lord and a granter of cruel bargains. The beauty is an assassin. What's at stake is not simply the love of two outcasts, but the kingdom itself. Hodge takes the fairy tale to the proportions of an epic. I'll try to be brief here. The characters are phenomenal. Nyx is a refreshing narrator. She's cold, brash, resentful, and at times, truly cruel. She's also unwaveringly loyal to the point of her own misery. She has compassion. She fights her own battles and thinks for herself. It's nice to see a character with such deep flaws who still manages to be heroic. You can also see that this isn't teenage angst. Her hatred is a product of growing up in a house with a father who chose to sacrifice her, the unlucky sister, the unloved sister. It makes her sympathetic. I also adored Ignifex. He has that cocky, blunt snarkiness that I'm pretty much powerless against. He's also vulnerable. His curse is a burden. He doesn't pretend not to be evil, but he longs for more. There's also something delightful about a person who can laugh just after being stabbed. Shade I liked less, perhaps because he's a little less vocal and isn't given as much screen time. However, he definitely surprised me later on. (Again, lips are sealed.) The most surprising character was Astraia, however. Nyx's twin, she seems naive and all laughs when we first meet her. The change in her character is almost unbelievable. I bought the explanation, but still think Hodge could have dropped a few more hints. 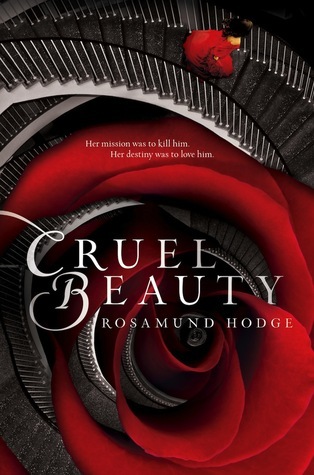 Cruel Beauty reads like a Greek epic crossed with a fairy tale. It's not nearly as dense as the former (don't worry!). Instead, what Hodge captures from Homer and Virgil is the atmosphere. It feels epic, somehow. Perhaps its the scope of the mythology and the world. It's certainly in part due to Hodge's mastery of language. She knows just which words to throw in to add that sense of grandeur. She's also a master at making things sound magical. I could live forever in the Water Room; her description alone was enough to take me there. This book was truly beautiful. Holy worldbuilding, Batman! Hodge could have thrown in a few names of Greek deities and gotten away with it. And then I'd be complaining instead of marveling at how detailed the world is. In just one book, she manages to fit in a lot of history and lore. It's not overwhelming, however. Details are slipped out as they're necessary. Some things are left to the imagination. Everything eventually serves a purpose. The thoroughness of the world makes the story feel grounded and real--and the world Hodge chose to create makes the story feel magical and mythic. However...Ignifex? Fire-bearer? Really? Could we not just pick something less obvious? A gorgeous fairy tale that gives all the best of magic and romance, with just enough poison. Cruel Beauty is getting nothing but raving reviews. I cannot wait to start it. The fact that she takes it and runs with it and you can compare it to Cinder gives me such high hopes :) I have been reading a couple of medicore re-tellings so I look forward to this one.